A 70 year old man with a background of metastatic colorectal cancer presents to the Emergency Department. He has a known large pelvic mass causing L ureteric obstruction, with a L ureteric stent in situ. He presents with 1 week of confusion and fevers. His blood tests showed acute renal failure (Cr 200, previously 85umol/L) and raised inflammatory markers. Urine microscopy showed > 100 red cells and white cells, as well as bacteria. 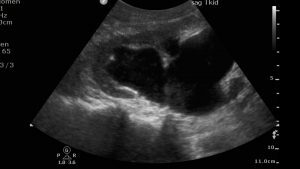 (2) Severe right sided hydronephrosis and hydroureter on right side. Normal cortical thickness (1.51 cm) Increased cortical echogenicity suggestive of oedema. 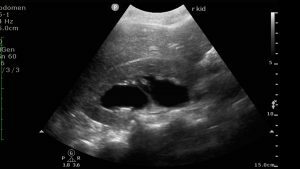 Renal tract ultrasound is the first line test for diagnosing urinary tract obstruction causing hydronephrosis. The advantages of renal tract ultrasound over CT is that it avoids the contrast and radiation risks of CT and can be performed at the bedside. 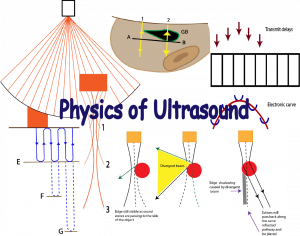 Ultrasound is particularly useful at diagnosing proximal obstruction. 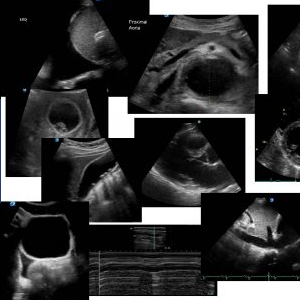 It may also visualise intra-renal stones, proximal uteteric and VUJ stones. 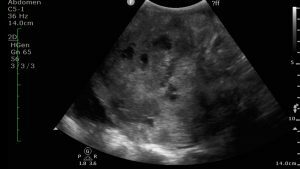 The sensitivity and specificity of point of care ultrasound in the detection of hydronephrosis is around 80% and the specificity is 94-99%. If hydronephrosis is long-standing, thinning of the medulla or cortex may occur. 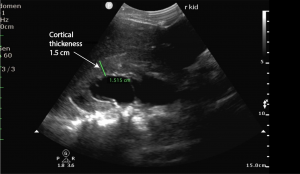 Hydronephrosis may be graded as mild, moderate or severe although this grading is subjective. 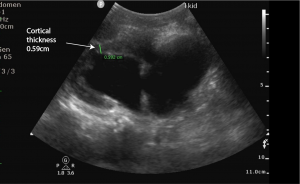 Mild hydronephrosis appears as minimal separation of the renal sinus. 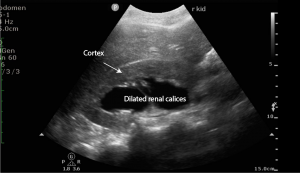 In moderate hydronephrosis, this separation is greater and extents into the calices. 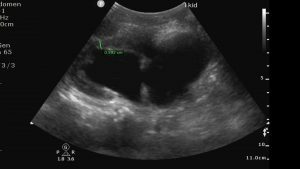 In severe hydronephrosis there is marked dilatation of the collecting system and often parenchymal thinning. Due to her advanced disease and comorbidities, this patient elected not to undergo percutaneous nephrostomy. He was discharged home with palliative care. In this case ultrasound allowed identification of new pathology in a patient with significant pre-existing disease and allowed a targeted management plan to be suggested. 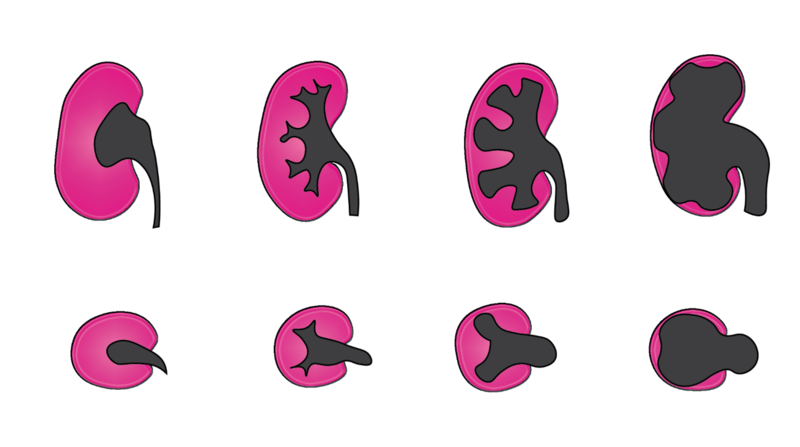 This entry was posted in Cases, Kidney. Bookmark the permalink.